Your search for gifts ideas for your gluttonous friend, relative or even colleague ends right here! Don’t know about you but I do like to take my time (to my husband’s utter annoyance) to find something for a dear friend or family that is a bit unusual, thoughtful, utility-based and if possible not from the high street. Here is a collection of few unique gift ideas for any occasion sure to make someone feel special and envelop you in the tightest hug! For a budding chef, a lover of flavours or experienced cook! This collection of spices and flavoured salts are a joy to add a depth of taste with ease to everyday cooking. A gift box set of 4 Spice blends complete with a cookbook with authentic Indian recipes. This is the ultimate gift for any curry lover. A bright coloured cooking book with authentic Indian recipes and spice tins to go with it. It’s so colourful and unique that you’ll want to show it off on your kitchen shelves! Take someone to a culinary journey of the world with these World Restaurant Favourites to make your own spice gift set. These clever little spice kits only contain 100% pure Gluten Free Spices. Great for sharing with loved ones and even better as a pressie for those budding chefs or aspiring cooks. A beautiful flavour packed gift for a seasoned chef or those beginning to experiment with flavours. Each 1 ounce test tube, contains a different salt with unique properties and tastes. Add delicious flavour, nutrients and minerals from these minimally refined salt. Handmade, natural wood base looks great on any kitchen countertop. Gift the mastery of grilling with this hand-picked smokehouse inspired spice blends. Mixed at perfect ratios tried and tested to make sure you get the ideal blends for the most mouth-watering BBQ ever! Set in a Sleak Box It’s possibly the best gift you could give to the gin lover in your life! Perfect for any occasion. Enjoy the look on their face the moment they open up their package and realize what you just got them. Don’t be surprised if they always remember you as the best gift giver ever! Everyone can enjoy a tasty adult beverage from time to time, and nothing is more enjoyable than creating your own drink flavours and styles that people love. We all know someone who loves tea! Instead of just gifting them an assortment of tea bags, why not give them something different that compliments their love! A unique tea that blooms into a flower for infused flavour tea. A hot bouquet of flowers by Whittard of Chelsea. Brew the tea in the little glass pot provided and watch the leaves unfurl, then pour it into the cup for a beautifully floral cuppa. Another quirky and fun creation by Whittard of Chelsea. Recreate a Mad Hatters tea party at home by gifting this fine bone china tea set in a beautiful wicker basket. Inside you’ll find a teapot and tea plate, plus two mugs featuring the Hatter and March Hare themselves with a selection of delectable jams and Queen of Hearts strawberry shortbreads. Let the party begin. The perfect gift for the tea lover in your life. Embrace the mood; Sip in the moment. A tea for every mood created by Numi. Let the moment seize you and grab a cup of tea to pair with it. This thoughtful gift welcomes everyone to take a deep breath and allow their mood to inspire which type of tea they should enjoy at any moment. Get raves from guests and from whom you gift this to with this stylish new thermos. Make an outstanding statement at gatherings and avoid heating the kettle each time. made from high-quality food grade material with vacuum insulated double walled stainless steel. Imagine the delight when someone receives these cute little teapot topped silver plated teaspoons. Use it every day to brighten up your morning cup or simply impress visitors. Made from high quality durable material this will surely stir up the happier side. One of my favourite items to receive as a gift is something that doubles up as a utility item. Here are few that are quirky and useful at the same time. Eye-catching splash shaped chopping board makes chopping pleasurable. Unique vertical drip edge to keep it stable against the edge of your worktop. Plus, the vertical drip can be easily removed to make it a completely flat cutting board. Nest 9 Plus Stacked Baking Set from Joseph Joseph. For the baking lovers – Introduce innovation and space-saving design with an abundance of colour into your culinary space, with the Nest 9 Plus from Joseph Joseph. The clever kitchen-companions slot neatly together within the mixing-bowl at the base, ensuring ease of storage. This quirky kitchen gadget might be shaped like a traditional office pencil sharpener, but it is actually used to create funky spirals and curls from carrots, courgettes and cucumbers! Perfect for creating a memorable and fun dinner presentation. Designers Jay have created this amazing pizza cutter, styled like a retro racing car. This nifty kit comes complete with air vents, racing number and of course a driver. Slice your pizza in style and make sure you’re top of the podium in the pizza-slicing stakes! Stunning functionality and unique design with is Utility Condiment Picnic Table! This brilliant design-led condiment stand from Temerity Jones is a delightful combination of form and functionality. Shaped like a picnic bench with a classic Fifties-style umbrella, this funky dining table accessory is actually a handy holder for condiments. This stylish set comes with four classic diner style condiment holders; for ketchup, mustard, salt and pepper. 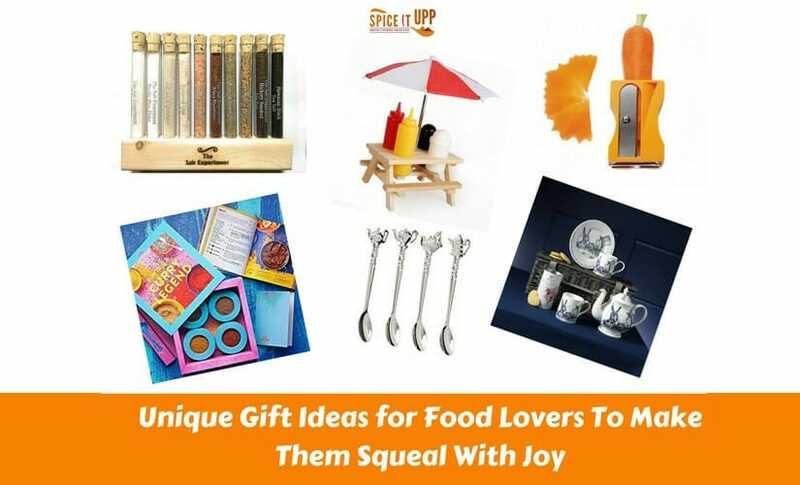 Hope you like this collection of gifts for any occasion for those who like to cook and eat! Do you have any favourite gift that you have received or gifted to someone? Do share them with me so that I get a chance to either spoil myself or someone else! I am looking into that tea box asap! Excellent and unique list! I love the Mad Hatters tea party set too! Such a fun idea! Love the spice blend kit! Super unique gift and people with any diet can enjoy spices. That cutting board is hilarious. The picnic bench condiment holder reminds me of something we had when we were kids. It was quite similar. These are some brilliant gift ideas for foodies. Love the peeler the most. All such great ideas! Love that cutting mat. I would love to receive so many of these! I especially like the fine bone china tea set and the salts. I may just have to treat myself! !